Listen to "Killer Clown: The John Wayne Gacy Murders" on your iOS and Android device. He was a model citizen. A hospital volunteer. And one of the most sadistic serial killers of all time. But few people could see the cruel monster beneath the colorful clown makeup that John Gacy wore to entertain children in his Chicago suburb. Few could imagine what lay buried beneath his house of horrors-until a teenage boy disappeared before Christmas in 1978, leading prosecutor Terry Sullivan on the greatest manhunt of his career. Reconstructing the investigation-from records of violence in Gacy's past, to the gruesome discovery of twenty-nine corpses of abused boys in Gacy's crawlspace and four others found in the nearby river-Sullivan's shocking eyewitness account takes you where few true crime books ever go: inside the heart of a serial murder investigation and trial. This is an excellent book for true crime fanatics. John Wayne Gacy is a classic serial killer case. 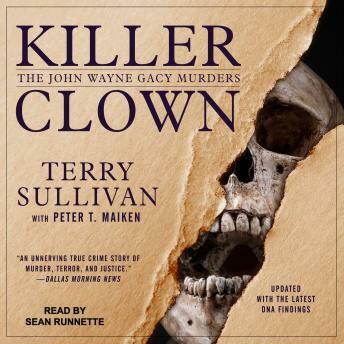 Terry Sullivan takes us with him in the hunt to bring a serial killer to justice. When I say he takes us through the case, I mean he takes us through the case. If there was paperwork that was filed, Terry wrote it in; if he took a left down a street during a surveillance shift, Terry wrote it in. Terry made sure the reader was along the ride when this case took it many turns, from every fumble to the eventual arrest of JWG. This is also a book that's heavy on the court trial proceedings. This case was significant to Terry, and it shows through the meticulous writing of this book. The detailed writing not only tells this story well, but it also reveals the passion that Terry has in his job-as a prosecutor and as a writer. As I mention before this is a book for true crime fans, people who know the case, but want to know more details about it. *This should go without saying, but trigger warning: there are very graphic descriptions of violence.